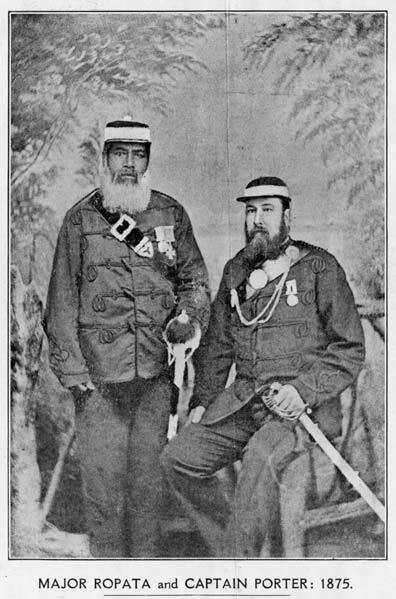 Rāpata Wahawaha was a leader of Ngāti Porou in fighting against followers of the Pai Mārire religion (also known as Hauhau) in 1865, and in the hunt for Māori prophet Te Kooti from 1868 to 1871. In this latter campaign Thomas William Porter served alongside him. Wahawaha remained a prominent Ngāti Porou leader until his death in 1897. Porter, who had married a Ngāti Porou woman, bought land for the Crown on the East Coast, whilst also buying land for himself. He later wrote Wahawaha’s biography.